along with flexibility and durability. Rubber insulating gloves– Classified by the level of voltage and protection they provide.Electrical hazards are extremely dangerous and can lead to severe burns and injuries. Wearing the proper protection while on the job is crucial to preventing an electrical hazardfrom occurring. Electrical gloves are comfortable and come in many different sizes, ensuringthat workers can get their job done without distractions. Our high voltage gloves and low voltage gloves also provide cut resistance, keepingworkers safe from any injury that may occur. Electrical hazards are extremely dangerous and can lead to severe burns and injuries. Wearing the proper protection while on the job is crucial to preventing an electrical hazard from occurring. Magid electrical gloves are comfortable and come in many different sizes, ensuring that workers can get their job done without distractions. Our high voltage gloves and low voltage gloves also provide cut resistance, keeping workers safe from any injury that may occur. 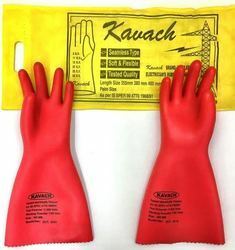 We are successful wholesalers, suppliers and traders of Kavach Electrical Safety hand Gloves 11 KVA and have never failed our customers on the aspects such as durability, design and patterns. Our team of skilled professionals stick to the industry standards and guidelines in order to deliver the best. This particular product of ours has come up as a preferred choice in the market. 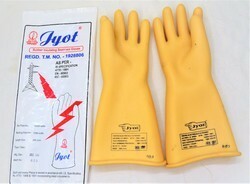 We sell Electrical Hand Gloves for various Voltage. We have Electrical Hand Gloves for , 11 KVA, 33KVA. 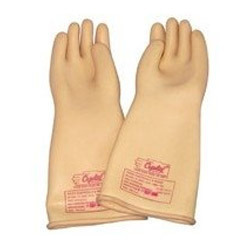 These hand gloves has seamless construction and made from specially compounded latex for compute insulation. 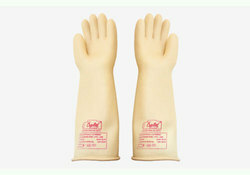 This industrial rubber hand gloves has excellent grip water resistance high strength lightweight and high durability. 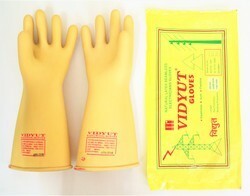 We provide high quality 33 KVA Vidyut Electrical Rubber Seamless Hand Gloves to our valued clients. They are widely known for their long service life and effectiveness. They are manufactured using very high quality raw-material purchased from the reliable and trusted vendors of the industry. 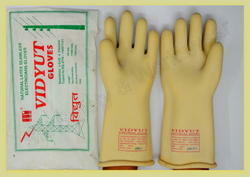 33 KVA Vidyut Electrical Rubber Seamless Hand Gloves is a good quality for electrical wroks. Being a well established organization, we bring forth an excellent assortment of Crystal Electrical Hand Gloves 33 KVA. Our offered gloves are widely appreciated by our prestigious clients for their precise design and fine finish. These gloves can also be availed in various sizes, designs and other related specifications. Our provided gloves are designed by a team of our vendors' adept professionals utilizing quality approved rubber and advanced technology. 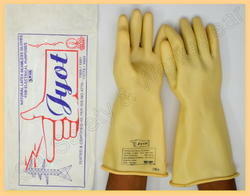 we are able to offer our valuable customers a wide array of Jyot Brand 33 KVA Hand Gloves. These gloves are designed by our experts using high-quality basic material and latest technology in adherence to the international quality standards. In order to make sure quality, the offered gloves are checked by our quality controllers on assorted parameters of quality. Material Rubber & Synthetic Polymers. 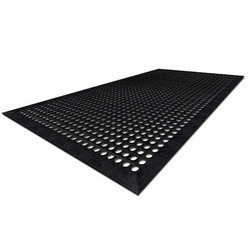 Safety Insulation Mats as per IS:15652 Superseding IS:5424/69 was introduced in the the year 2007, with the view of technical advancement & more stringent Industrial safety parameters. Insulating mats safeguard life of Electricians & other Technicians, in case of any accidental current leakage while working on AC or DC installations. Synthetic Insulation mat confirms complete safety of workers handling Live electronic equipments. Indoor or Outdoor portable protection element for site engineers working on live equipment. Made of Dielectric “Elastomer” which possess elastic properties and may be natural or synthetic in nature. Typically a combination of rubber & Synthetic Polymers. To furnish the diverse requirements of our clients in the best possible manner we are involved in offering an extensive range of Electrical Gloves. These are extensively used for protecting the wearer from the fine splashes and are highly reliable in nature. Offered gloves are highly demanded in market due to their availability in various sizes. We We are one of the prominent names in the industry, offering Seamless Electrical Hand Gloves in various places like hospitals, amusement parks, water plants, office buildings, manufacturing plants and schools. They have excellent grip, water resistance, high strength, lightweight and high durability. I. Theey have seamless construction and made from specially compounded latex for compute insulation. 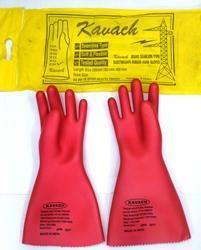 We study the market demand for Seamless Rubber Gloves regularly and keep optimum stock levels.